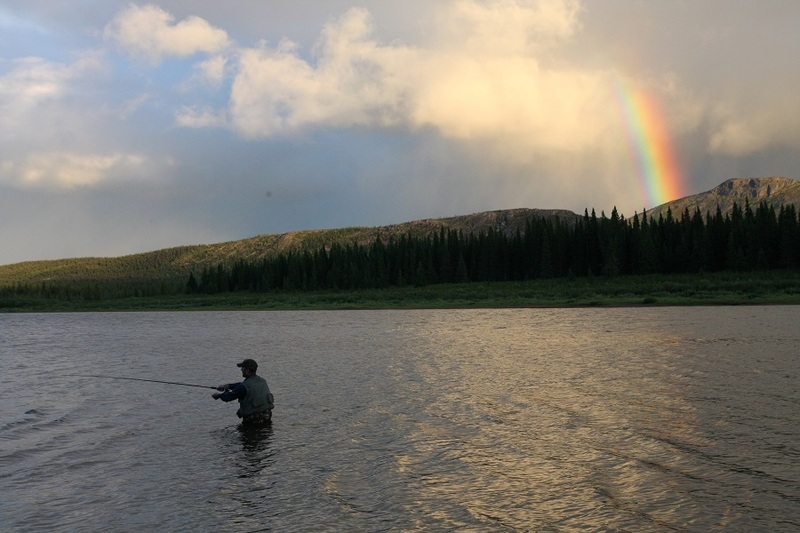 Labrador brook trout have chiseled out an existence in one of the most rugged and spectacular environments in the world. 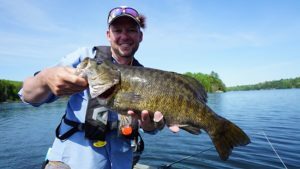 Over time, these char have evolved into aggressive predators capable of consuming a variety of prey, from small mayflies and caddis to smaller brook trout and pike, even mice and voles. Featuring dense muscle mass, broad shoulders, and a corresponding nasty attitude, Labrador brook trout are measured in pounds rather than inches. 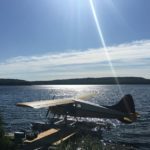 So what do you need to make the most of your Labrador excursion regarding rods, lines, leaders, flies and miscellaneous gear? Six and seven weight rods are your best option as Labrador’s trophy brook trout share their homes with pike. Six and seven weight rods provide the necessary backbone should you, or more accurately when, you cross paths with a large pike. If you can, take along at least two rods. Having at least two rods on hand ensures you are prepared for a variety of scenarios. When you hit the water, it is a good idea to have two rods rigged and ready, one for streamers the other for dry flies or mouse patterns. 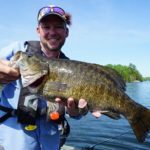 Most of the time you will probably use a floating line, taking along two isn’t a bad idea: one for casting large bulky streamers and mouse patterns and the second for casting small dries and emergers. You should also include a sink tip, a clear intermediate, and a fast sinking type III line. 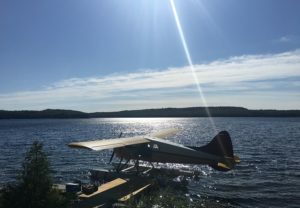 Sink tip and sinking lines enable you to explore deeper reaches or prospect lakes and the small steadies connecting river sections. Leaders and tippet for Labrador brookies aren’t complicated. When using floating lines, lengths of 7.5 feet to 9 feet are perfect. Short, stout leaders easily turn over larger flies and help facilitate accurate casts, which are essential when brook trout fixate on emerging mayflies and caddis. These smaller food sources concentrate feeding behavior, meaning a brook trout won’t waste energy travelling great distances to chase down small prey. For sinking lines short four foot lengths of level OX or 1X fluorocarbon attached to a 2x fluorocarbon tippet work well. 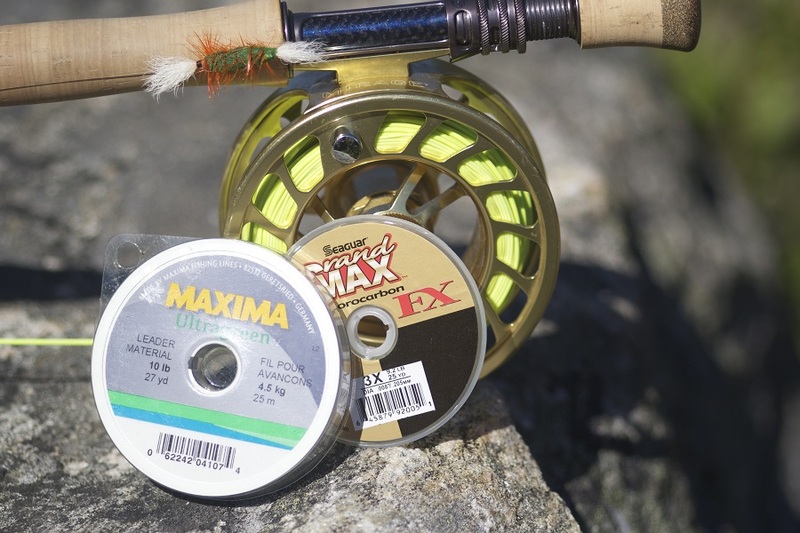 As brook trout share their homes with aggressive pike, a wire bite tippet is recommended when fishing large streamers and surface patterns such as poppers and mice. Thankfully, Labrador brook trout aren’t leader shy, and the wire tippet doesn’t seem to bother them one bit. Having a selection of small #12-#14 barrel swivels on hand to serve as a connecting link between your nylon leader and bite tippet is handy when fishing streamers. You can also join leader and bite tippet using loop knots such as a perfection loop. Form a loop knot at each end of the leader and a 12-inch section of bite tippet. Connect the two together using a loop to loop connection. Don’t forget wire cutters. Knotable bite tippet is tough to cut using traditional leader nippers. Long nose pliers or forceps are also handy for removing flies from the ragged toothy mouth or a large pike or brook trout. For those who enjoy the thrill and the mystery of matching the hatch, casting dries and emergers to sipping brook trout rivals other North American rivers and streams famous for their surface feeding browns, and rainbows. During the early season, caddis and mayflies often form a significant portion of a brook trout’s diet. Make sure you have a selection of 2x-5x tippet to capitalize on this exciting opportunity. 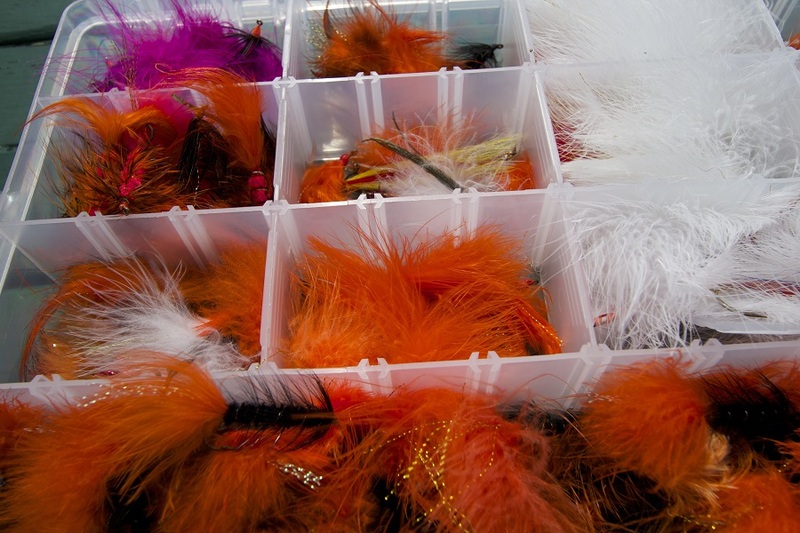 Stocking fly boxes prior to any trip always adds excitement. 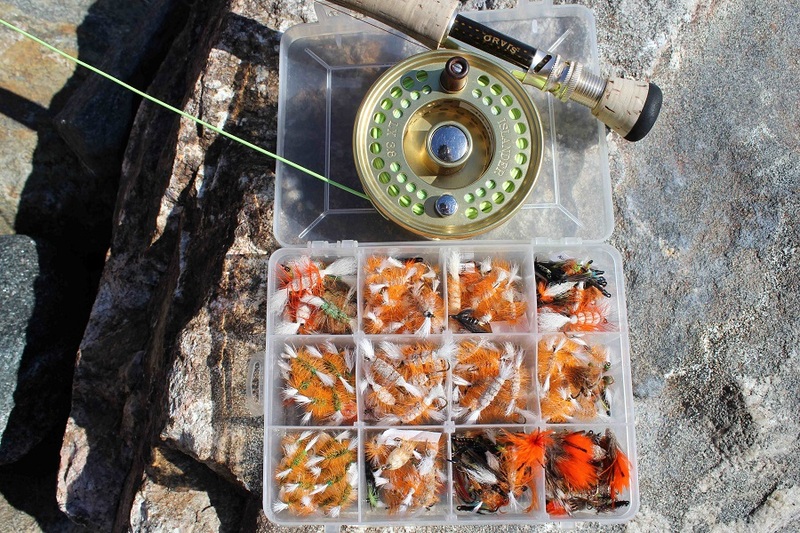 With each fly you tie or buy and then subsequently place in your fly box the anticipation of the upcoming trip intensifies. Just what you include in your boxes will be determined by the timing of your trip, but it will inevitably necessitate a wide range of patterns. Brook trout are aggressive carnivores. They consider just about anything that crosses their paths as food. 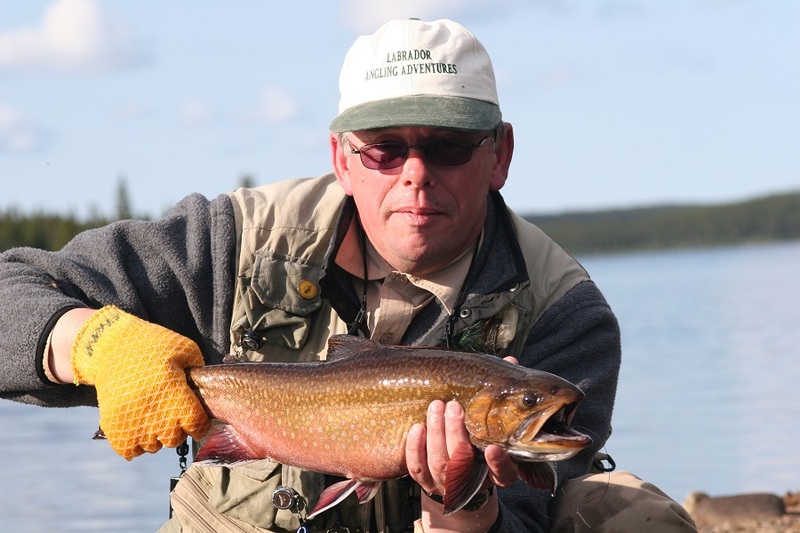 Streamers suggesting leeches or baitfish are a Labrador brook trout staple. Once the major hatches of the season are finished by late June or early July streamers in sizes #6 through #4 are the flies of choice. This is especially true in the latter stages of the season when brook trout begin to stage in preparation to spawn. During this part of the season brookies can be tight lipped as their focus switches from feeding to reproduction. A selection of mobile streamers in gaudy color schemes may be required to shake their focus and trigger their naturally aggressive nature. In addition to black, brown and white, make sure your streamer selection includes patterns containing blue, yellow, orange and a touch of red. 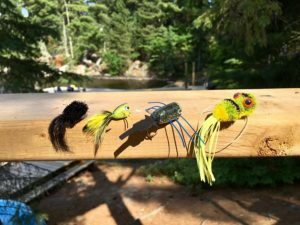 Traditional streamers such as the Muddler Minnow still take a large percentage of brook trout, making them a favorite choice for many Labrador lodges and outfitters. Other Muddler variations to consider include Marabou Muddlers, Zuddlers and Zoo Cougars. Woolly Buggers are also excellent choices in a variety of colors from white through black. Don’t be afraid to bring your favorite streamers from your local waters either. On one trip I had a handful of MOAL’s (Mother Of All Leeches) on hand. These large, supple patterns tied on a Dacron core were originally designed for west coast steelhead, but worked wonders on Labrador brook trout—white MOAL’s in particular. 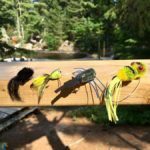 I recall my first Labrador brook trout trip, when, after using traditional mice patterns and a superb local pattern called the Shaving Brush, I had great fun experimenting with a variety of bass poppers and deer hair frogs. Once I figured out the specific retrieve rhythm for each pattern to get the maximum surface disturbance, the Labrador brook trout crushed them with reckless abandon. Other patterns you should consider include #6 or #4 Bombers. Large foam and rubber leg patterns such as Chernobyl Ants and Turk’s Tarantula also work well. These buoyant patterns spring to life when waked or stripped through promising brook trout ambush positions. 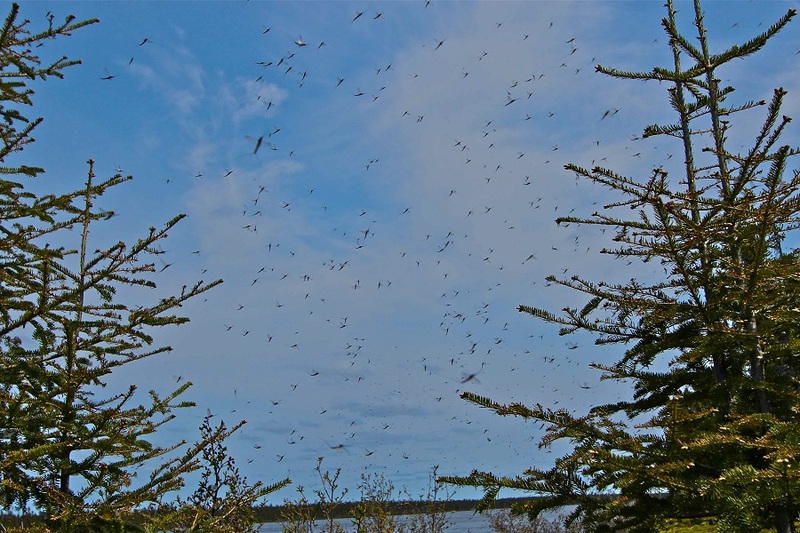 During the June and early July, when mayflies and caddis emerge in large numbers, Labrador transforms into dry fly heaven. Concentrated emergences draw huge brook trout to the surface. At times the numbers of rising fish is staggering. If you anticipate mayfly or caddis activity make sure you have a range of dry flies in sizes #10-#16. 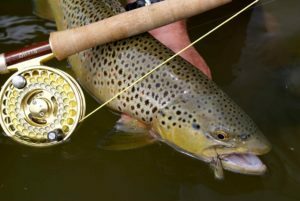 Popular choices include, Royal Wulffs, Adams, Irresistibles, Green Drakes, Brown Drakes, Stimulators, Goddard Caddis and Elk Hair Caddis—all in brown, tan and black. 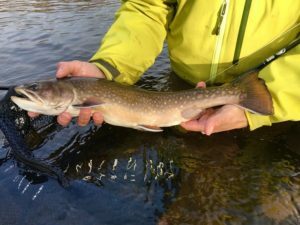 When targeting rising fish, it is important to study the rise forms, not only to determine fish location, but also exactly what stage of an emergence the brook trout are focused upon. Although Labrador brook trout may not see the same number of anglers and flies as other regions of North America they can still be fussy. 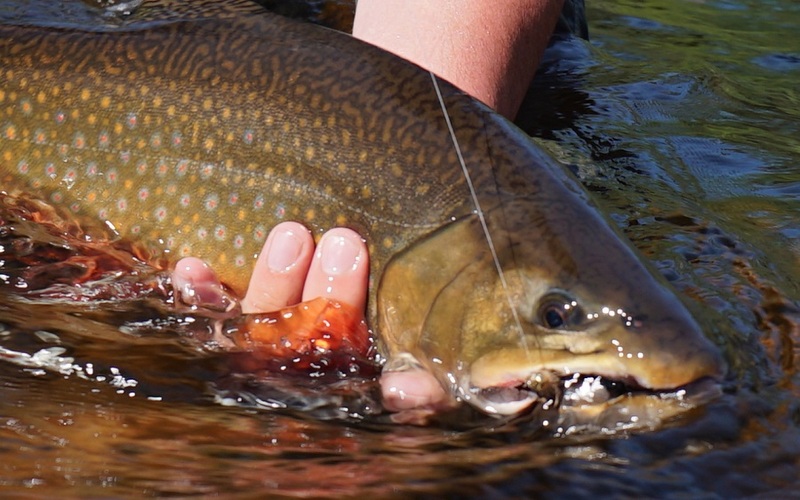 Many times fly anglers seeing rising fish assume trout are taking adults, unaware that trout prefer to target helpless emergers and cripples. Rising trout showing only their backs and shoulders is classic emerger feeding behavior. Using a dry fly in these situations is often unproductive. 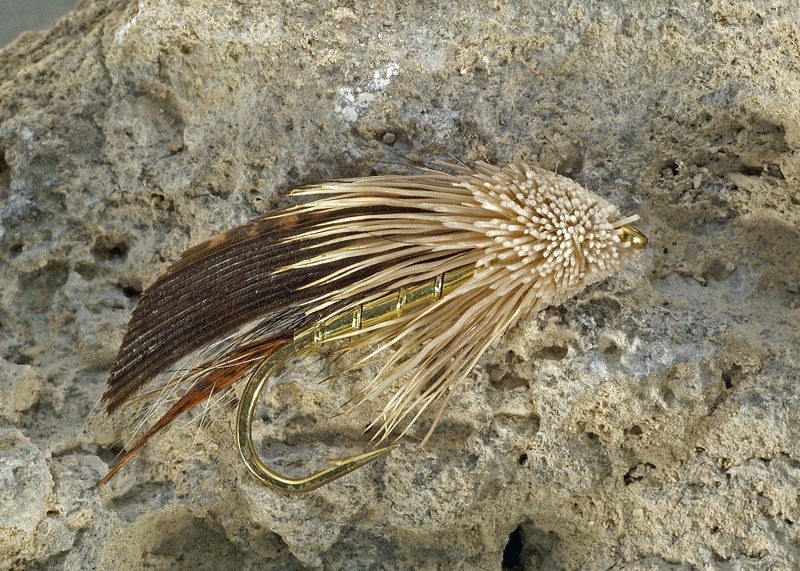 Having a handful of transitional emerger patterns and soft hackles on hand can save your trip. Nymph patterns can also be important too. I always have a supply of #10-#14 Prince Nymphs, Hare’s Ear Nymphs, Copper Johns, Pheasant Tails and caddis pupa patterns such as Lafontaine Sparkle Pupa on hand. 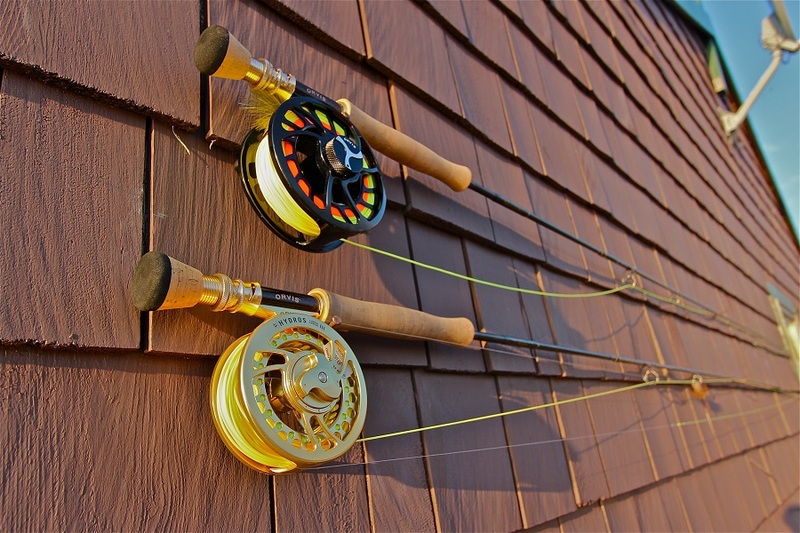 As with any trip there are always items to consider besides rods, lines, leaders and flies. Labrador is no different. In addition to your clothing, toiletries, waders, wading gear, rain jacket and camera don’t forget insect repellant and sun screen. Make sure your wading boots have bottom gripping soles and cleats. In Labrador, slippery algae covered rocks are common. Many Labrador rivers resemble rock gardens, full of boulders and rocks of all shapes and sizes. A collapsible wading staff is a good idea, not only for steadying balance but also for probing the often tea colored water for a safe route. 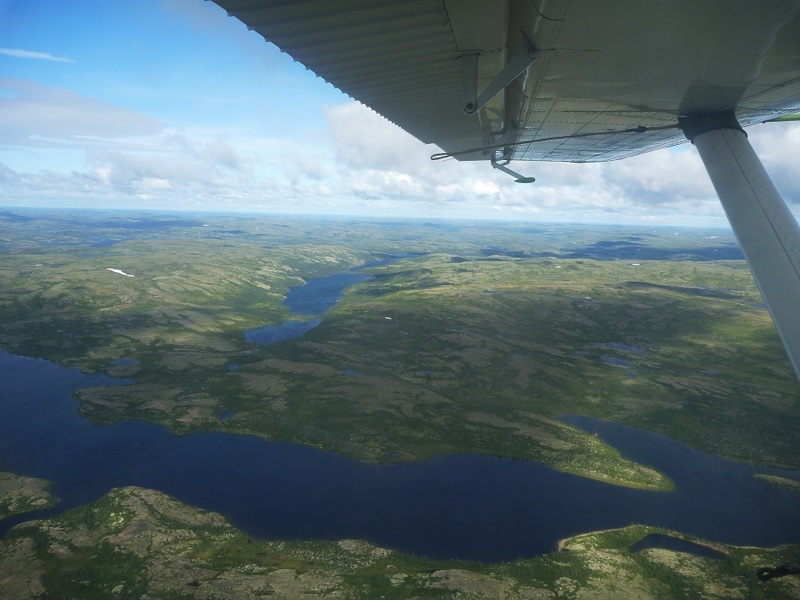 For many, pursuing trophy brook trout amidst the rugged beauty Labrador is famous for, constitutes the trip of a lifetime. Don’t forget to communicate with your destination lodge or outfitter prior to arriving. Advice from them will ensure that you take along the right gear for the expected conditions. Arriving prepared for what may lay ahead only adds to your enjoyment.